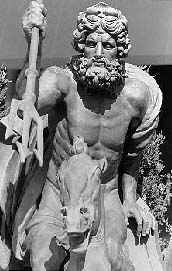 In Greek mythology, Hades was the god of the underworld. Hades, the roller coaster, more than lives up to it’s name. It boasts the single most impressive tunnel section I’ve ever experienced. The tunnel’s not only long, it’s a white knuckle journey through a terrifying pitch black abyss. Mt. Olympus, located in Wisconsin Dells, WI, is a smaller theme park with several go-kart tracks and an array of water slides. In the past decade, the park has expanded and started to add more coasters. Everything is Greek-themed with coasters like Zeus, Cyclops, and even a rare water coaster called Dive to Atlantis. Since it’s a smaller park, I enjoyed discounted admission off of an already reasonable entry price, free parking, and shorter lines. On the other hand, Mt. Olympus won’t be winning any awards for park operations anytime soon. The ‘Hades experience’ starts with a station that you have to climb three stories to reach. After your hike, you’re greeted with a sparse station, just large enough for the queue and the train. There’s no theming and indifferent ride ops that are unfriendly and don’t speak to you. One thing I always look for in a world-class coaster is a raucous station with enthusiastic, efficient ride ops and a D.J. that hypes you up as you leave and greets you upon your return. You won’t find any of that on Hades. Luckily, the ride itself makes up for the operations shortcomings. Thanks to the elevated station your ride starts with a short drop from the very beginning. You better have your hands up or be ready to hold on tight, the opening has a few pops of air, twists and turns, and more speed than you’d expect from such that short drop out of the station. Some fans have called this opening a microcosm of the entire ride and I agree. There’s plenty of action pre-lift hill.Then, you start your 13-story climb. The big drop is fairly steep for a wooden coaster at 65 degrees and all you see is a hole below as the track dives below the parking lot. The next thing you know you’re in complete darkness. You can’t even see your hand in front of your face and it’s not like the dark tunnels on The Voyage that are fairly brief, this truly is a journey. As you tear through the dark at 70 mph the train banks and dips as it tries to throw you around like a rag doll. You can’t see a thing, but I could’ve sworn I saw some red eyes down there. It’s insane! Did I mention that this coaster lived up to its name? As you start to see light breaking through at the other end, you realize that the train is not right side up. You climb up the wall and ride along it, but because of the darkness and speed you can’t even tell. Check out this pic from the tunnel with the lights on. You come down from the wall and rise up into the turn around point. The columns around the turn around section are a great touch. You crest a hill and drop back down near the highway that passes the park, rise up a shorter hill and drop back down into the tunnel. The ride back is less eventful, but still very dark. As you exit two back-to-back airtime hills follow. Next, you reach the finale, which is the weakest part of the ride. I remember a bit more roughness than the rest of the ride. Finally, you reach the brakes. As the train re-enters the sub-par station, the cold ride ops release you and your on your way. Ever ridden Hades or been to Mt. Olympus? What was your experience like? Leave a comment below. I especially like how Hades gets off to wild start as soon as you leave the terminal. Yea, it beats the snot out of you at the end, so if you should avoid it if you break easily. Rode this ride on 8-26-2011. My brain hurt from this ride. I don't mean I got a headache, my brain hurt during and after the ride from getting rattled. It has been three days and my neck is still sore. I can't believe this ride is allowed to operate. I'm just glad I rode it by myself and didn't put my wife and kids on this ride. Hi. I just discovered your site while looking for coaster rumors. Nice blog. On yesterday, August 30, 2011, I took my first trip to Wisconsin Dells and Mt. Olympus. Hades is visually stunning, but inflicts bodily harm. I'm no coaster newbie, and can deal with some pain. But, Hades is pretty rough. What is really sad about the park is that Hades is much more tolerable than Zeus (terrible pain) and Cyclops. It seems the park has a colletion of body slammers. It's like WWE. I wish I could have ridden Hades when it premiered in 2005. It must have been incredible. But, on yesterday, I kept wishing that Rocky Mountain Construction could get a hold of it. As far as the ride ops are concerned, the young lady was just spectacular and really nice to me. The older man in dirty nike tennis shoes had the charm of a herpes blister. Awesome coaster Zeus seems like nothing compared to this. The only thing that could make it better is if it went upside down. worst wooden roller coaster I've ever ridden. I'm sorry but a wooden roller coaster should not be going that fast, i didn't feel safe at all. It was crazy I've never felt sick on a roller coaster until I rode Hades and i couldn't even enjoy it because I was too worried about hanging on and holding my daughter. I'm more of a steel coaster fan. But its a popular coaster cause the line is always very long every time I visit Mt Olympus so I'm glad others enjoy it. Just not for me or my daughter. The past few months, Hades has had a sign about 1/2 way through the queue that says, "Hades is extremely rough today. Please keep both hands on the bars" or something like that. HADES is an underrated woodie to me, but it is still lacking.. ALOT for the title of a must ride wooden roller coaster some parts of the ride are mostly the underground tunnel, and the same goes for the park itself it has its pros and its many cons and is lacking alot to be a must visit park but i hope this place really shapes up more in the near future, better ride ops and staff, cleaner bathrooms and such, less fees and alot more fun! more tlc with the rollercoasters and keep – up with all the attractions would make this place a lot better. 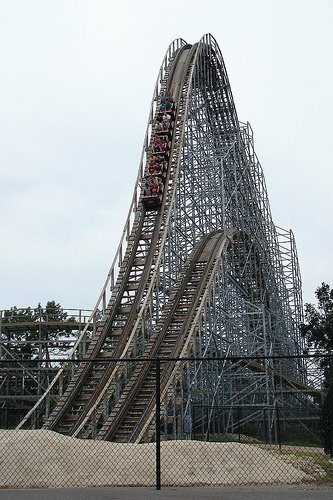 What a sleeper this coaster was! I never thought I would find such a rough and violent woodie in a little park like this, easily one of my favorites. A guy riding the car ahead of me broke his eyeglass case on the ride, you can't ask for more than that. This is an EXCELLENT roller coaster. Worst coaster I have ever been on. This coaster will leave you with head and neck trauma. I rode it on 7/29 and regret it, I got whiplash from the roughness of the coaster. It needs a serious overhaul. I have never wanted a coaster ride to end as badly as I did on Hades. I have been on every roller coaster in Mt. Olympus and Hades is the best! I've been on it 6 or 7 times and the drop looks smaller and smaller every time, so I'm hoping to go to Valley fair and ride the Wild Thing and Steel Venom. This beat the living crap out of me on 8-15-2012. 4 days later still feeling it. So I was on a road trip earlier this month; we were leaving Mall of America and planing to head to Adventureland in Iowa, and then to Holiday World. To our surprise, (and great relief) we checked online, and discovered that both parks would be closed on the week that we'd be arriving there! So we re-routed our trip to the east a bit to stop here and at Six Flags Great America. I had been looking forward to riding the Voyage, only for it to be closed, so, in a desperate effort to hit at least one gravity group coaster, I suggested we hit Mt.Olympus to make up for Holiday World. I highly doubt the Voyage could be as epic as Hades was. It had to be the best Wooden Coaster I've ever been on. Sure, it was jerky, but aren't all wooden coaster supposed to be at least a bit? The tunnel is the crowing achievement of this amazing ride. Once you get down there in the darkness, it's survival of the fittest. Hold on for dear life. If your anywhere near the Dells and don't stop to try this top-notch attraction, your missing out big time! It's defiantly the smoothest of the 4 wooden coasters there. My new favorite Wooden Coaster! I rode it now just recently. Hades might be one of the craziest rides ive ever been on. Its so fast its unreal and so insane I kinda even wanted it to be over. There were deffinatley some rough parts, but the ride no doubt gave an incredible rush. I would say that it is insanely thrilling, but don't expect to have a hands in the air fun ride. This is one ride you can't help but hold on. I haven't been on this but I have been on Voyage and Ravine Flyer (also from Gravity Group). Both were amazing. I've not come across any recent reviews of Mt. Olympus that suggests they take care of their rides or have a well run park. Voyage had retracking this year and Ravine Flyer was in great shape when I rode it in 2011. If I read a trip report that suggests Mt. Olympus is fixing their deteriorating rides I'd consider a trip there to ride Hades and the rest. Wisconsin Dells is the only Amtrak stations in the country I know of that is a modest walk from coasters (you can see them from the train as you go by). I think Hades is the most PAINFUL roller coaster EVER. My friend had broken ribs and I had a super bruised shoulder. I thought that my head was going to fall off. NOT FUN would rate it 0.5 out of 10 due to painfulness of the ride. I rode Hades in August of 2011. It fractured my 6th vertabre and broke my 7th and 8th vertabre. Out of work for 4 months, still on painkillers. Will never be the same. No compensation offered from the owners!! DON’T GO ON THIS RIDE!! !